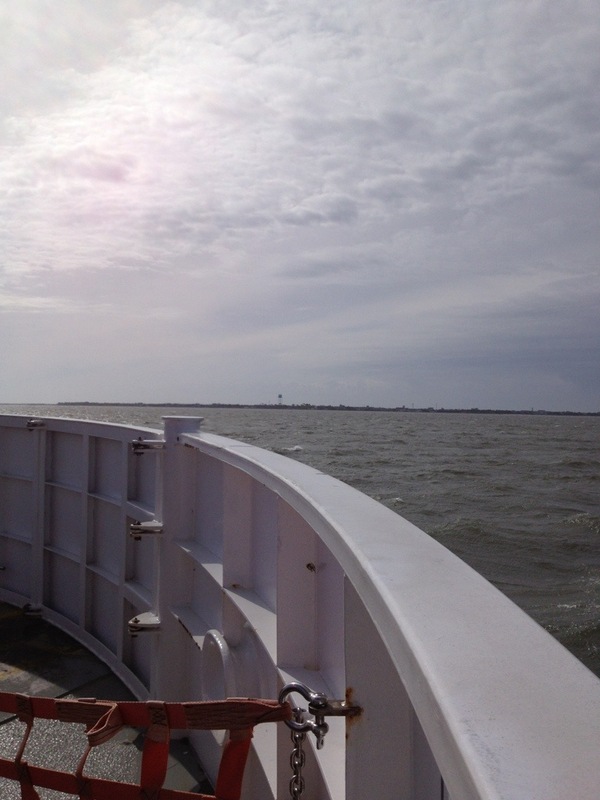 Plentiful rain and a ferry trip to Ocracoke Island and Hatteras Island. | Arthur in the Garden. Plentiful rain and a ferry trip to Ocracoke Island and Hatteras Island. 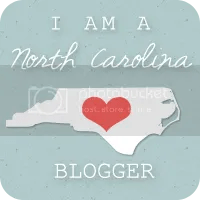 It was my birthday May 1st so I decided I wanted to take a trip to Ocracoke and Hatteras Islands. 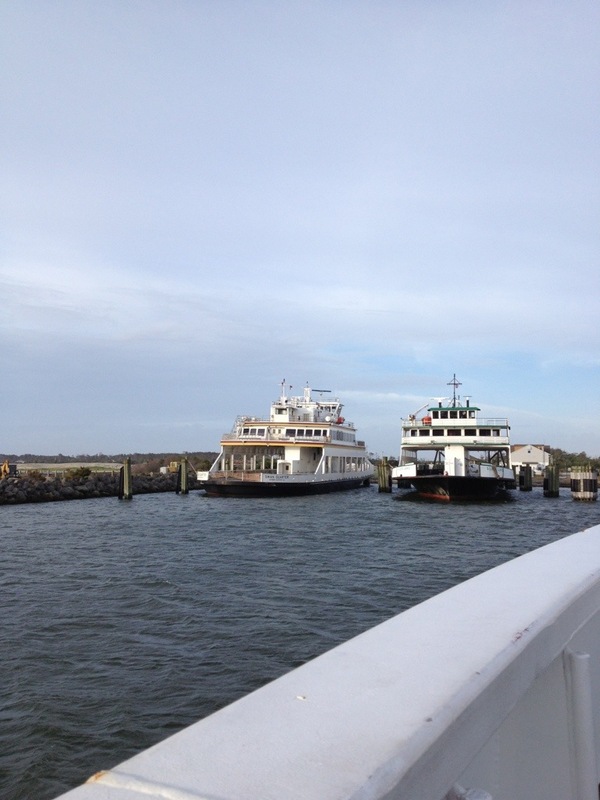 My favorite part of the trip is the 2 and a half hour ferry ride from Cedar Island to Ocracoke Island. It crosses Pamlico Sound and for part of the trip there is no land in sight. The Sounds are the bays created by the string of the Outerbanks islands which skirt the North Carolina coast. The open bodies of water were named Sounds by the Irish settlers because the water was quiet and calm or “sound”. It’s rather peaceful and the constant hum of the ferry engines encourages a nap! You can also feed the seagulls off the stern of the ferry or sometimes talk to the locals. They have a local accent called “the DownEast brogue”. It reminds me of a heavy Irish accent. Sometimes they are very difficult to understand, not only for the accent, but also for some of the Old English words they use. They are descended from Irish fisherman who settled the coastal areas. The maternal side of my family is descended from the O’neals of Ocracoke. Of course, back then the boat only came once a week and this explains why my grandmother had twelve bothers and sisters. Most were involved in fishing at some point in their lives. With the collapse of the fishing industry tourism is the major mode of income now. The weather was windy with spotty rain. On the thousands of trips I have made as a child with my family, then later with friends, this trip was the most rough ferry ride I have ever experienced! The ferries rocked and my car, which was first on the ferry and loaded on the bow of the boat, was splashed many times with waves of water from the Pamlico Sound. Because of the off season timing and state budget cuts the ferry schedule is reduced. Andy and I missed the last ferry back to the mainland at four PM and had to stay in one of the small hotels: Blackbeard’s Inn. The area was a favorite place for the pirate Blackbeard to hide his boat and his name is on many businesses out there. His ship sank not too far away and he was decapitated by the British. There is not much to do in the off tourist season. Everything closes at dusk! No coffee shops! Thus, we watched Hoarders all evening! Nothing makes me feel better about my house cleaning skills then watching five hours of Hoarders! The ferries at the Cedar Island ferry landing as we were leaving the dock. The wide open waters of Pamlico Sound as the ferry was approaching Ocracoke Island and the Village of Ocracoke after the two-and-a-half hour ferry ride. The Versa on the deck of the “Sealevel” ferry. 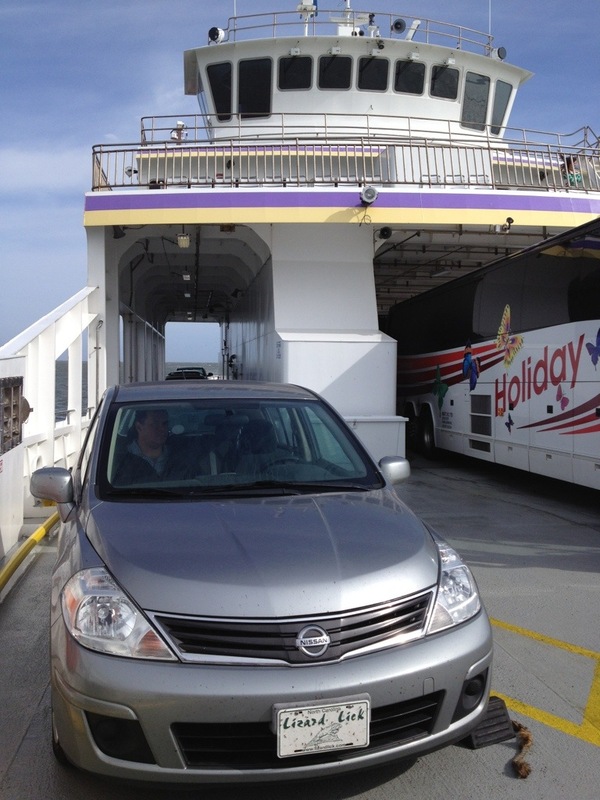 The ferries have lobbies that are above the deck but Andy and I usually remained in the car napping or reading. Each ferry is painted the color of a North Carolina University. It just so happened that the Sealevel is painted the colors of ECU (East Carolina University) where I attended for undergraduate studies. Approaching Ocracoke Island and the village of Ocracoke. The harbour is called Silverlake. 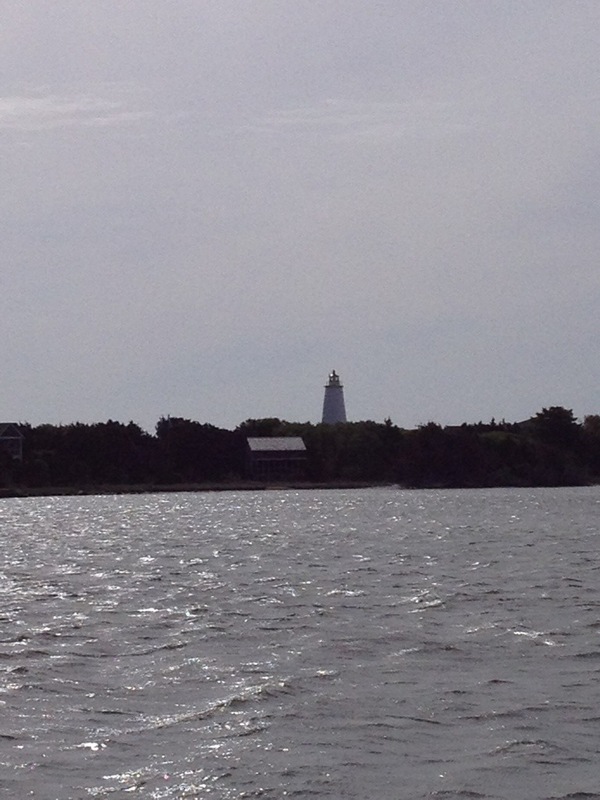 You can see the Ocracoke Lighthouse which was built from 1798 to 1823. It’s 75 feet tall and 25 feet wide at the base. 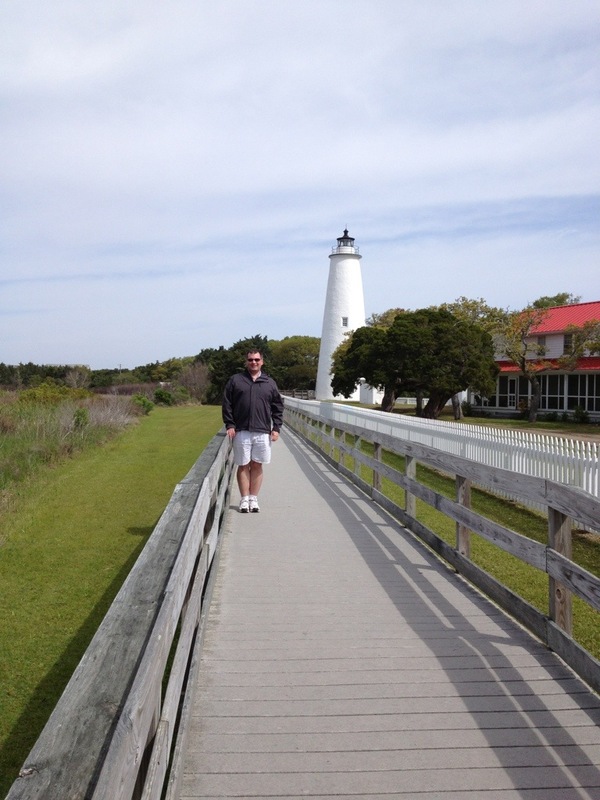 Here is a closer view of the Ocracoke Lighthouse with Andy standing in front. 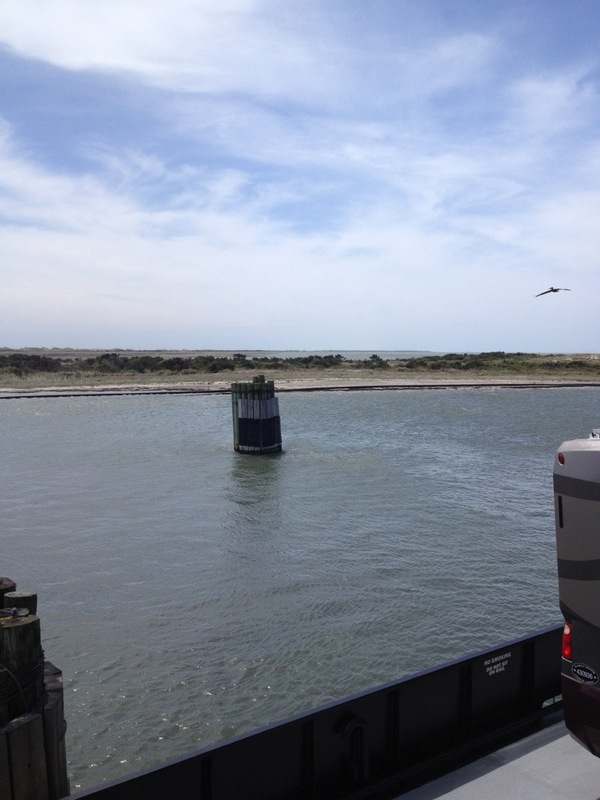 This is a picture of the Hatteras Island ferry at the Northern end of Ocracoke Island. The wind was blowing sand so hard it was caked on the windward side of the car and in the window. The salt in the air speeds rust so much so that most metal will rust overnight! 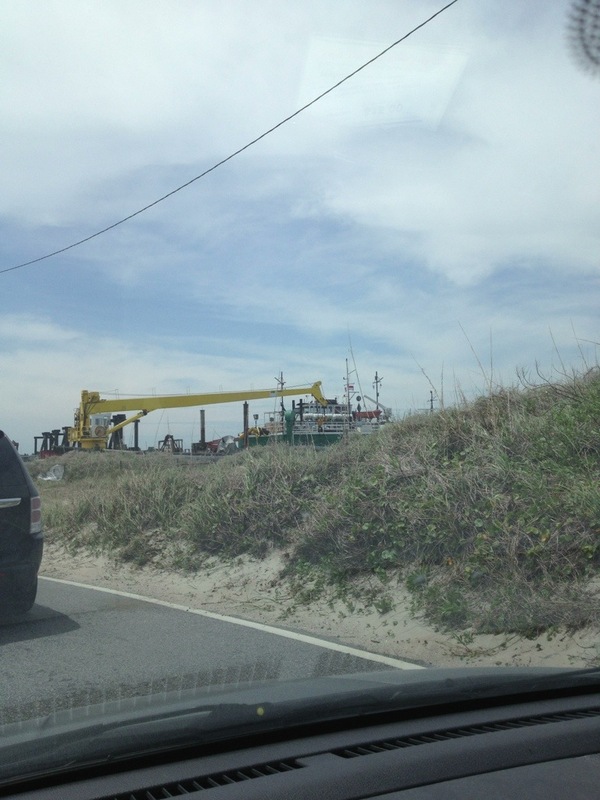 The ride from Ocracoke to Hatteras is usually a shorter 15 minute ride but because of budget cuts the channel has not been dredged in a while so the ferry must take another channel making the ride now almost an hour. This is the reason we missed the last ferry back to Cedar Island and had to spend the night on Ocracoke. This is the ferry landing on Cedar Island. Because I had not planned to spend the night I did not bring my IPhone charger so my phone died after this picture! I am usually prepared for just about anything but decided to travel light! Wouldn’t you know this would be the one trip where a combination of budget cuts and bad weather would have made my usual packing of an overnight bag and a phone charger an asset! Budget cuts make stay-cations the norm. But Hubby home between business travels, we visited a local tourist place last week. One that the schools here all take the children too when they are younger for a field trip. http://www.hansherr.org/ an off season tour left us the only two with our guide through. And the weather co-operated. Thanks for the photos. We didn’t take any – we just had a very relaxing afternoon. Thanks for your visits. Cheers! That looks like a great place to on a vacation! It’s a little too quiet for a hyper person like me but a few days I can take! Sounds like a lovely boat trip. Had to google Pamlico Sound, couldn’t place it. From the maps and photos it appears to be a very pretty area with the Sounds and lush greenery. Glad you had a nice visit! Oh and Happy Birthday! Thanks. It is a huge body of water, thus, the two and a half hour ferry ride to cross it. I love those ferry rides! I think the name is Native American? Most in that area are.